Two men accused of involvement in the deadly attack on Togo's football team ahead of the Africa Cup of Nations in January have gone on trial in Angola. The men have denied the charges of murder and armed rebellion. The rebel Front for the Liberation of the Enclave of Cabinda said it carried out the attack that killed two people. 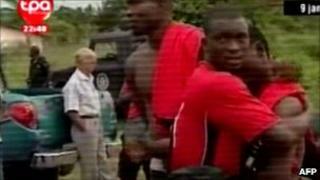 The incident overshadowed the football tournament which was supposed to boost Angola's image after its three-decade civil war that ended in 2002. The attack against the Togolese football team and its Europe-based players sent shockwaves around the world. As the bus made its way through the Angolan province of Cabinda, armed men are said to have leapt from the bushes and opened fire. The machine-gun attack was reported to have lasted 20 minutes. Within hours senior members of the Front for the Liberation of the Enclave of Cabinda (Flec), said they had masterminded the shooting. Days later, Joo Antnio Puati, who is from the Republic of Congo, and Daniel Simba, an Angolan were arrested in connection with the attack. Eleven months on, the men's lawyers at the court in Cabinda told the BBC that both men denied the charges and any links to Flec. Mr Simba, a peasant farmer, told the court that he did not know anything about the attack until the soldiers arrived at his home nearby to arrest him. The trial has now been adjourned until Monday. Cabinda, home to most of Angola's oil supplies, is separated from the rest of the country by a small strip of the Democratic Republic of Congo. It has been at the centre of an independence struggle for decades. A peace deal was signed in 2006, but factions of Flec have continued to carry out attacks in the province, their most recent last month.